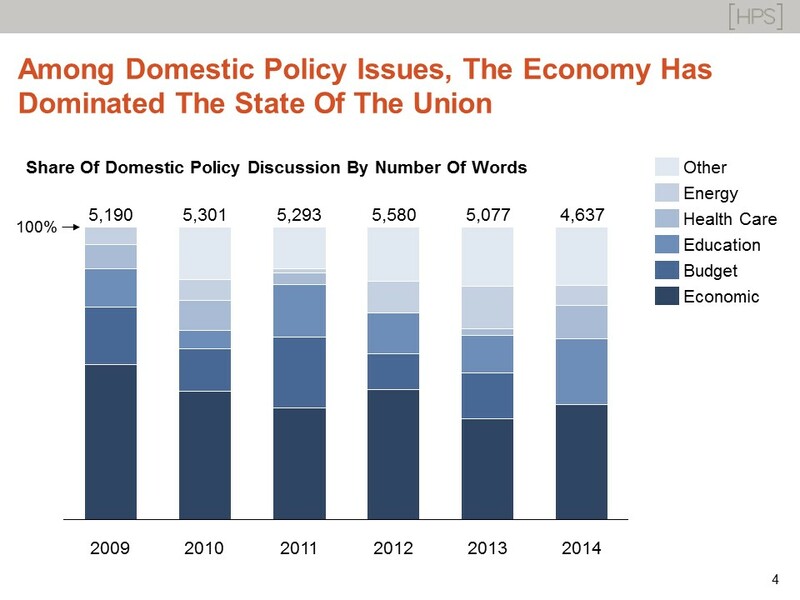 We analyzed President Obama’s six State of the Union addresses (2009-2014) to discern trends and shifting policy priorities over time. While domestic policy issues have largely dominated his presidency, foreign policy has been on the rise as a topic in recent years. Among domestic policy issues, the economy has dominated the speeches, though the way he talks about the economy has changed. Early discussion about the crisis and the broader economy has given way to an emphasis on wages and inequality in recent years. The debt and deficit, which was once a major area of discussion, has almost disappeared from the speech. Despite healthcare reform being one of his biggest legislative accomplishments, the President has not made it a major focus of any Address. The President has changed how he addresses energy, with much more focus on oil and gas than was the case in earlier addresses. In addition to the attached presentation, see more analysis on our Silk.co page.